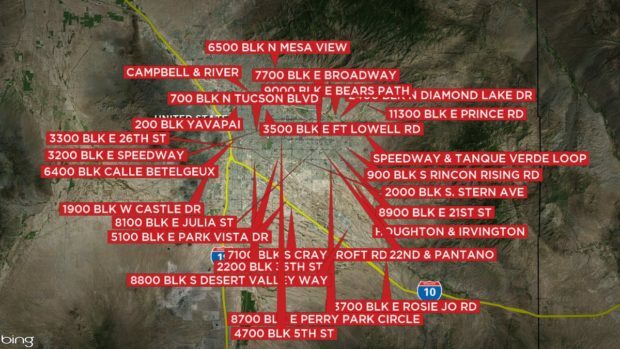 Officials with the Tucson Wildlife Center are concerned after seeing an uptick of animals being shot and killed in neighborhoods. So far this year, 35 animals have been found dead — up five from 2015. “It is surprising how many animals are being shot illegally,” said Lisa Bates, founder and executive director of Tucson Wildlife Center. Animals have been found shot on Broadway and Pantano, Tucson and Broadway and Swan and Sunrise; all areas near homes. Staff say this is alarming, because the BB gun pellets and bullets could hit someone, even a child playing in their backyard. “That is scary because if they are shooting and there are children around…I think it is really dangerous and I think it should stop,” said concerned parent Lupita Montijo. Others say maybe the shooters believe the animals are a threat. But coyotes are just part of a long list of animals shot and killed. That list includes pigeons, doves, a pelican, a duck, ravens, raptors, cooper’s hawks, red-tailed hawks, a harris’s hawk, a great-horned owl, a peregrine falcon, an American kestrel, javelina and coyote. “I think that it is horrible. I think that if it is adults, that they need to control their childish urges, and if its children they should control their children,” said concerned parent Maggie Kemper. 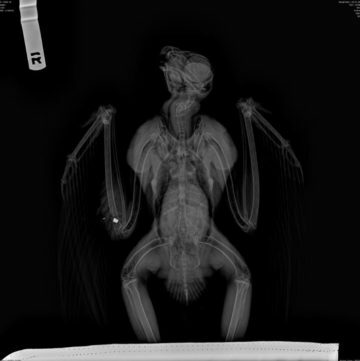 Anyone who finds wildlife suffering from projectile injuries should contact the Tucson Wildlife Center immediately at (520)290-9453, so they can get the animal veterinary treatment. “Even if the animal dies, evidence can still be collected in the form of radiographs – or X-rays – and the metal projectiles,” Bates said. Arizona Game and Fish officials want to remind the public that killing certain types of birds could cost the shooter a $15,000 fine and up to six months in jail.